The headquarters is on the grounds of Eastbury Park. In 1939, during the Second World War, the Royal Air Force took over the site for the use of RAF Coastal Command which made use of the Eastbury house and also created a network of underground bunkers and operations blocks. The house was used as an Officers' Mess though it was subsequently damaged by fire. In 1953 the Commander-in-Chief, Home Fleet, gained an additional NATO responsibility as Commander-in-Chief, Eastern Atlantic, as part of SACLANT, and the Eastern Atlantic NATO military command structure was established at the Northwood Headquarters. The Commander-in-Chief Home Fleet still flew his flag however in HMS Tyne at Portsmouth. In 1960 the Commander-in-Chief Home Fleet moved to Northwood, in 1963 the Naval unit at Northwood was commissioned as HMS Warrior and in 1966 the NATO Channel Command (a post also held by the Commander-in-Chief Home Fleet) moved to Northwood from Portsmouth. The RAF completely vacated the site in 1969. In September 1971, when the post of Commander-in-Chief Fleet was established, the Royal Navy took over responsibility for the whole site and in 1978 the Flag Officer Submarines also moved his Headquarters to Northwood. As Headquarters of the Commander-in-Chief Fleet, the site was the controlling Headquarters for Operation Corporate, the Falklands War, in 1982. The Permanent Joint Headquarters was established on site in April 1996. In 2002, following a rationalisation, the Commander-in-Chief Fleet moved the majority of his staff to Portsmouth and handed over the Northwood site to the Chief of Joint Operations. In 2006 major construction works commenced to improve the functionality of the site: the works, which involved the refurbishment or replacement of many of the key buildings, were carried under a Private Finance Initiative contract by Carillion. The Queen visited the site on 6 May 2010 to open the main Permanent Joint Headquarters building, part of a £150 million redevelopment of the site. Joint Forces Command was established on site in April 2012. Joint Forces Command (JFC) is a tri-service organisation managing allocated joint capabilities from the three armed services. 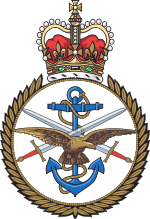 Permanent Joint Headquarters (PJHQ) is a tri-service organisation holding Operational Control of British armed forces joint military operation. PJHQ is headed by the Chief of Joint Operations. Single-service operations remain under the operational control of the appropriate front-line command. Within the same building as the Permanent Joint Headquarters there is also a Multi National Headquarters for the command of European Union military operations. Personnel to support this structure are seconded from existing NATO and national posts on the site, augmented from elsewhere as required. This Multi National Headquarters is currently staffed by EU personnel commanding Counter Piracy operations. The Commander Operations remains with the current operations staff on the Northwood site. Among Commander Operations' responsibilities are command of Commander Task Force (CTF) 311 (UK attack submarines) and CTF 345 (UK nuclear missile submarines). Royal Navy Reservists of HMS Wildfire moved back into a new building on the site in June 2011, having moved from the site to Brackenhill House on Oxhey Drive South in 1988. The NATO Allied Maritime Command is based at Northwood, and comes under the Command and Control of the Allied Command Operations. Joint Support Unit Northwood, providing administrative support, life support, facilities and supplier management. Defence Equipment and Support (DE&S) providing Communications and Information Systems support. A detachment of Military Provost Guard Service personnel providing force protection. ^ Bowlt, Eileen. M (1994). Ruislip Past. 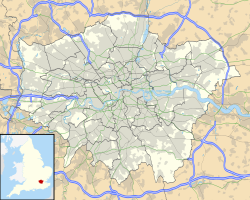 London: Historical Publications. ISBN 0-948667-29-X. ^ a b c d e f Ministry of Defence (2011). "Northwood Headquarters". Ministry of Defence. Retrieved 11 April 2011. ^ "British Task Force Units". Naval-History.org. Retrieved 23 October 2006. ^ "Permanent Joint Headquarters". Armed Forces. Retrieved 22 May 2014. ^ "Admiral Sir Jonathon Band KCB (left) and Admiral Sir Alan West KCB DSC (right) at the Change of Command Ceremony at the NATO HQ at Northwood". 2 August 2002. Retrieved 22 August 2012. ^ Stocks, Caroline (31 July 2006). "Carillion awarded military assignment". Building. Retrieved 11 April 2011. ^ Matti, Siba (6 May 2010). "Queen to visit Northwood military HQ". Uxbridge Gazette. Retrieved 17 May 2012. ^ a b "New Joint Forces Command established". 2 April 2012. Retrieved 22 May 2014. ^ "SUEZ WAR OF 1956". Godfreydykes.info. 5 November 1956. Retrieved 19 June 2013. ^ Binnie, Adam (15 June 2011). "Royal Navy Reservists move back into Northwood Headquarters". Watford Observer. Retrieved 17 May 2012. ^ "MARCOM". NATO. Archived from the original on 21 November 2013. Retrieved 26 December 2013.